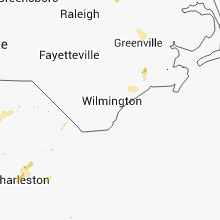 The Holly Ridge, NC area has had 1 report of on-the-ground hail by trained spotters, and has been under severe weather warnings 9 times during the past 12 months. 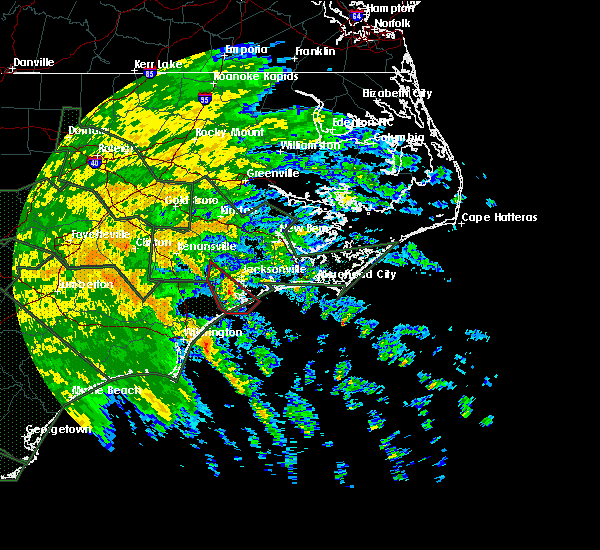 Doppler radar has detected hail at or near Holly Ridge, NC on 25 occasions, including 2 occasions during the past year. 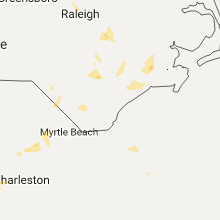 9/15/2018 11:30 AM EDT At 1129 am edt, a severe thunderstorm capable of producing a tornado was located near sea view pier, or 8 miles east of north topsail beach, moving northwest at 45 mph (radar indicated rotation). Hazards include tornado. Flying debris will be dangerous to those caught without shelter. mobile homes will be damaged or destroyed. damage to roofs, windows and vehicles will occur. tree damage is likely. this dangerous storm will be near, sea view pier around 1135 am edt. sneads ferry around 1140 am edt. 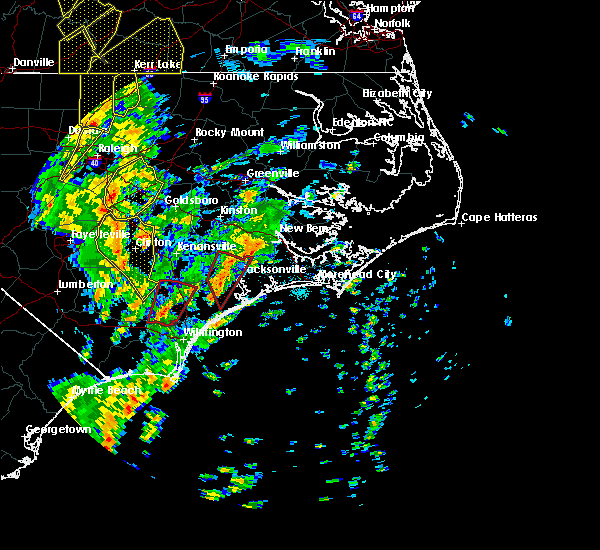 jacksonville, dixon and folkstone around 1145 am edt. 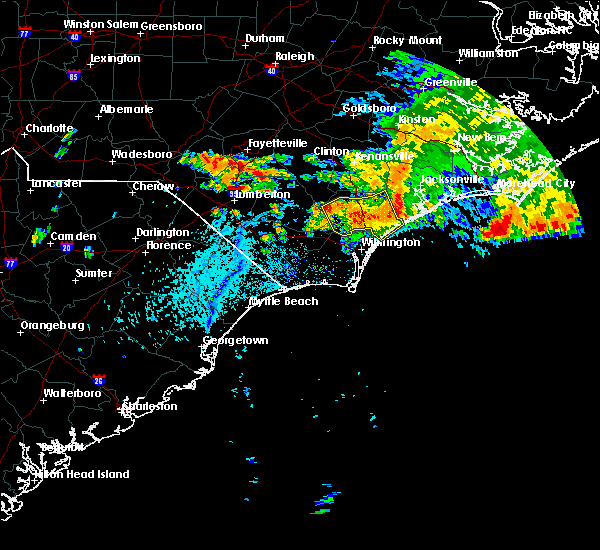 camp lejeune center and verona around 1150 am edt. new river station around 1155 am edt. half moon and catherine lake around 1205 pm edt. albert j ellis airport and richlands south around 1210 pm edt. richlands and petersburg around 1215 pm edt. Other locations impacted by this tornadic thunderstorm include haws run and lyman. 6/24/2018 11:03 PM EDT At 1103 pm edt, a severe thunderstorm was located over white stocking, or near burgaw, moving southeast at 25 mph (radar indicated). Hazards include 60 mph wind gusts and penny size hail. Expect damage trees and power lines. locations impacted include, burgaw, surf city, hampstead, topsail beach, white stocking, maple hill, murray town, ashton, topsail, woodside, edgecomb, rocky point, st. helena and pender memorial hospital. This includes interstate 40 between mile markers 392 and 408. 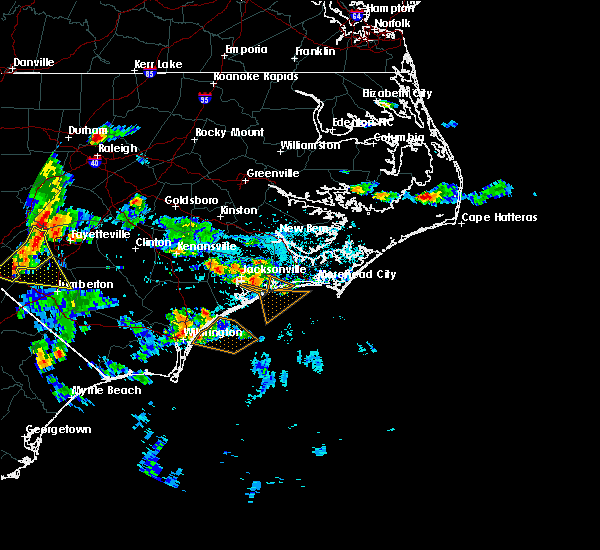 6/24/2018 7:16 PM EDT At 716 pm edt, severe thunderstorms were located along a line extending from near maribel to near janeiro to near wildwood to near bogue inlet pier to near maple hill, moving southeast at 35 mph (radar indicated). Hazards include 60 mph wind gusts. Expect damage to roofs, siding, and trees. Locations impacted include, jacksonville, havelock, morehead city, north topsail beach, newport, harkers island, piney green, new river station, camp lejeune center, stella, swansboro, hubert, south river, cape carteret, north river, straits, smyrna, merrimon, pine knoll shores and harlowe. 6/24/2018 7:02 PM EDT At 701 pm edt, a severe thunderstorm was located near maple hill, or 10 miles northeast of burgaw, moving southeast at 20 mph (radar indicated). Hazards include 60 mph wind gusts and quarter size hail. Minor hail damage to vehicles is possible. Expect wind damage to trees and power lines. 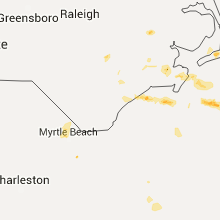 6/14/2018 2:46 PM EDT At 245 pm edt, a severe thunderstorm was located over sea view pier, or near north topsail beach, moving southeast at 20 mph (radar indicated). Hazards include 60 mph wind gusts and quarter size hail. Hail damage to vehicles is expected. expect wind damage to roofs, siding, and trees. Locations impacted include, north topsail beach, swansboro, folkstone, onslow beach, sneads ferry, sea view pier and holly ridge. 6/14/2018 2:26 PM EDT At 226 pm edt, a severe thunderstorm was located over sneads ferry, or 8 miles south of camp lejeune center, moving southeast at 20 mph (radar indicated). Hazards include 60 mph wind gusts and quarter size hail. Hail damage to vehicles is expected. Expect wind damage to roofs, siding, and trees. 9/21/2017 4:12 PM EDT At 411 pm edt, severe thunderstorms were located along a line extending from near maple hill to near verona to dixon, moving west at 10 mph (radar indicated). Hazards include quarter size hail. Damage to vehicles is expected. Locations impacted include, north topsail beach, verona, dixon, folkstone, sneads ferry and holly ridge. 5/30/2017 1:32 AM EDT At 131 am edt, a severe thunderstorm was located near sneads ferry, or near camp lejeune center, moving east at 40 mph (radar indicated). Hazards include 60 mph wind gusts and quarter size hail. Hail damage to vehicles is expected. expect wind damage to roofs, siding, and trees. Locations impacted include, jacksonville, morehead city, newport, piney green, camp lejeune center, swansboro, cape carteret, sneads ferry, bogue inlet pier, hammocks beach state park, sea view pier, cedar point and holly ridge. 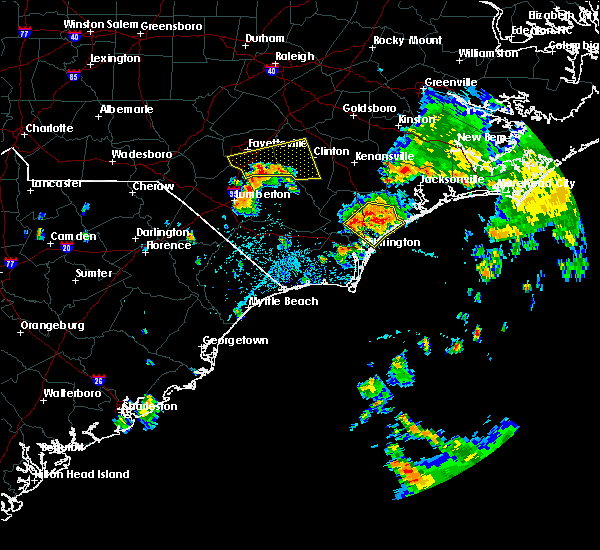 5/30/2017 1:13 AM EDT At 113 am edt, a severe thunderstorm was located near edgecomb, or 7 miles north of surf city, moving northeast at 55 mph (radar indicated). Hazards include 60 mph wind gusts and quarter size hail. Hail damage to vehicles is expected. Expect wind damage to roofs, siding, and trees. 5/5/2017 5:38 AM EDT At 537 am edt, a severe thunderstorm capable of producing a tornado was located near richlands south, or 7 miles southwest of half moon, moving north at 45 mph. another storm capable of producing a tornado was located north of holly ridge (radar indicated rotation). Hazards include tornado. Flying debris will be dangerous to those caught without shelter. mobile homes will be damaged or destroyed. damage to roofs, windows, and vehicles will occur. tree damage is likely. this dangerous storm will be near, half moon, richlands south and albert j ellis airport around 545 am edt. richlands around 550 am edt. Other locations impacted by this tornadic thunderstorm include holly ridge. 5/5/2017 5:18 AM EDT At 517 am edt, a severe thunderstorm capable of producing a tornado was located near edgecomb, or 9 miles northwest of surf city, moving north at 40 mph (radar indicated rotation). Hazards include tornado. Flying debris will be dangerous to those caught without shelter. mobile homes will be damaged or destroyed. damage to roofs, windows, and vehicles will occur. tree damage is likely. this dangerous storm will be near, new river station around 535 am edt. albert j ellis airport around 540 am edt. half moon and richlands south around 545 am edt. richlands around 550 am edt. Other locations impacted by this tornadic thunderstorm include holly ridge. 10/8/2016 11:28 AM EDT At 1127 am edt, a severe thunderstorm capable of producing a tornado was located near new river station, moving northwest at 65 mph (radar indicated rotation). Hazards include tornado. Flying debris will be dangerous to those caught without shelter. mobile homes will be damaged or destroyed. damage to roofs, windows, and vehicles will occur. tree damage is likely. this dangerous storm will be near, albert j ellis airport around 1140 am edt. Other locations impacted by this tornadic thunderstorm include holly ridge. 10/8/2016 11:17 AM EDT At 1117 am edt, a severe thunderstorm capable of producing a tornado was located over sneads ferry, or 11 miles south of camp lejeune center, moving northwest at 70 mph (radar indicated rotation). Hazards include tornado. Flying debris will be dangerous to those caught without shelter. mobile homes will be damaged or destroyed. damage to roofs, windows, and vehicles will occur. tree damage is likely. this dangerous storm will be near, new river station around 1125 am edt. albert j ellis airport around 1135 am edt. Other locations impacted by this tornadic thunderstorm include holly ridge. 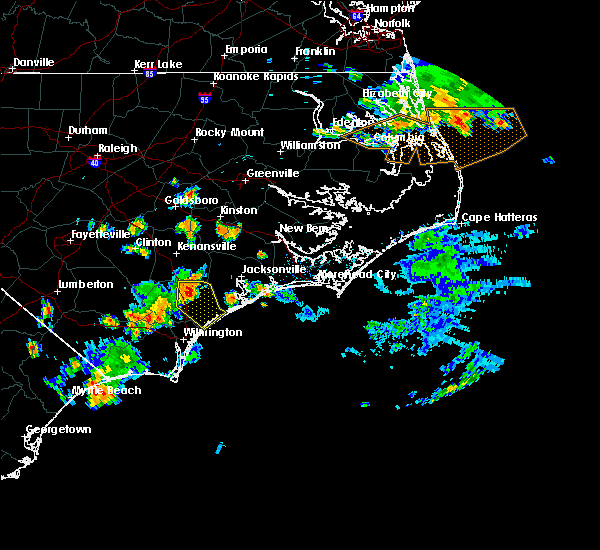 7/31/2016 3:05 PM EDT At 305 pm edt, a severe thunderstorm was located over woodside, or near surf city, moving east at 20 mph (radar indicated). Hazards include 60 mph wind gusts and quarter size hail. Hail damage to vehicles is expected. Expect wind damage to roofs, siding, and trees. 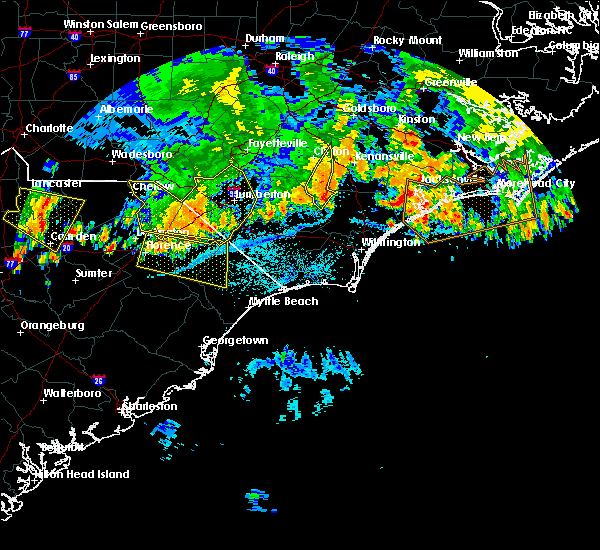 7/9/2016 12:26 AM EDT The severe thunderstorm warning for pender county will expire at 1230 am edt, the severe thunderstorm which prompted the warning has weakened, therefore the warning will be allowed to expire. 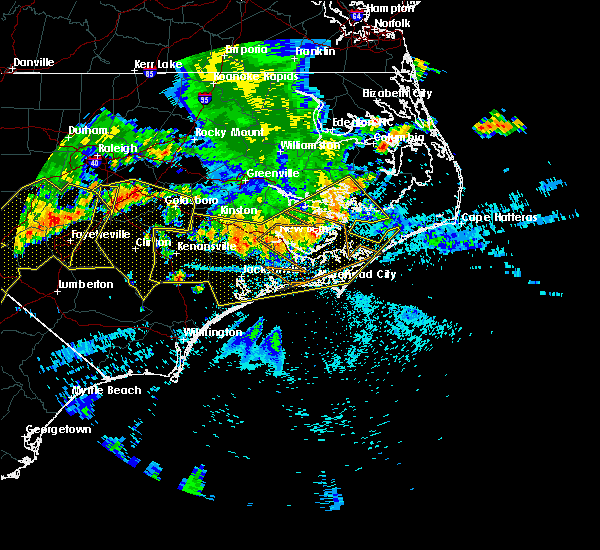 a severe thunderstorm watch remains in effect until 200 am edt for southeastern north carolina. 7/9/2016 12:11 AM EDT At 1210 am edt, a severe thunderstorm was located near white stocking, or 10 miles east of burgaw, moving east at 35 mph (radar indicated). Hazards include 60 mph wind gusts and penny size hail. Expect damage to roofs. siding. and trees. locations impacted include, burgaw, surf city, hampstead, topsail beach, topsail, murray town, white stocking, rocky point, woodside, edgecomb, maple hill, ashton, st. Helena and pender memorial hospital. 7/8/2016 11:30 PM EDT At 1130 pm edt, a severe thunderstorm was located near penderlea, or 11 miles southwest of wallace, moving east at 35 mph (radar indicated). Hazards include 60 mph wind gusts and penny size hail. Expect damage to roofs. siding. And trees. 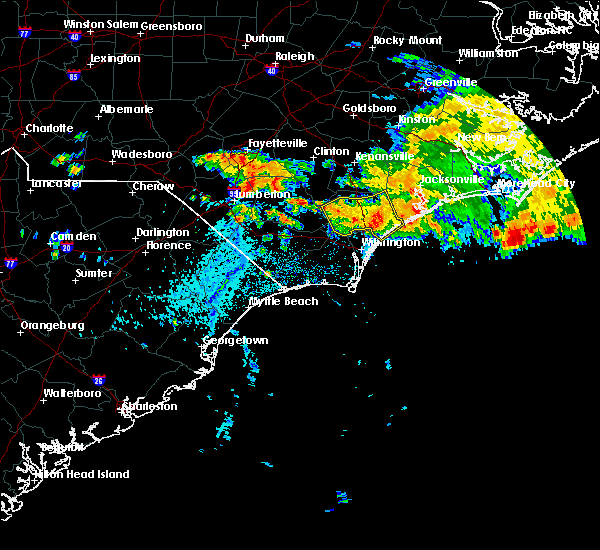 7/8/2016 10:31 PM EDT At 1030 pm edt, severe thunderstorms were located along a line extending from 7 miles northwest of ocracoke ferry terminal to 7 miles north of morehead city to near half moon, moving southeast at 45 mph (law enforcement indicated). Hazards include 60 mph wind gusts. Expect damage to roofs. siding. and trees. Locations impacted include, jacksonville, new bern, havelock, morehead city, newport, wallace, warsaw, camp lejeune center, pumpkin center, half moon, new river station, piney green, james city, mount olive, swansboro, cape carteret, rose hill, richlands, pine knoll shores and beulaville. 4/7/2016 7:37 AM EDT At 736 am edt, doppler radar indicated a severe thunderstorm capable of producing damaging winds in excess of 60 mph. this storm was located near penderlea, or 9 miles southwest of wallace, and moving northeast at 55 mph. 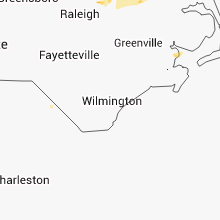 7/23/2015 3:10 PM EDT The severe thunderstorm warning for pender county will expire at 315 pm edt, the storm which prompted the warning has weakened below severe limits, and no longer poses an immediate threat to life or property. therefore the warning will be allowed to expire. however heavy rain is still possible with this thunderstorm. 7/23/2015 2:43 PM EDT At 240 pm edt, doppler radar indicated a severe thunderstorm cluster capable of producing quarter size hail and damaging winds in excess of 60 mph. 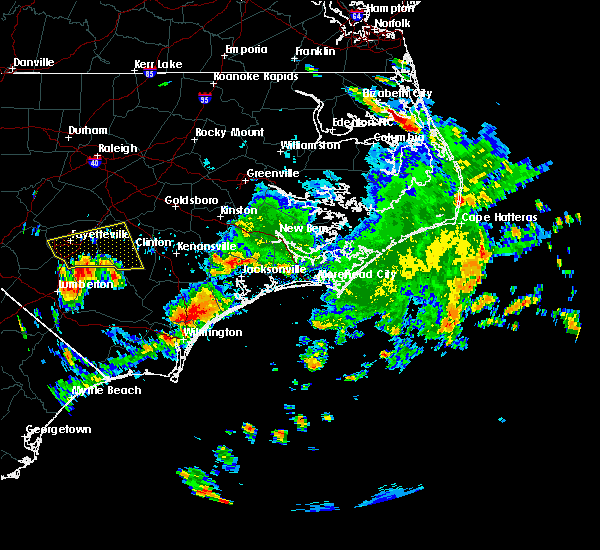 this storm covered much of pender county mainly south of a maple hill to watha line. the storm was moving to the east at 20 mph. locations impacted include, burgaw, surf city, rich inlet, hampstead, topsail beach, topsail, montague, currie, the borough, malpass corner, murray town, white stocking, scotts hill, rocky point, maple hill, ashton, point caswell, wards corner, woodside and rooks. this includes interstate 40 between mile markers 393 and 412. 7/23/2015 2:17 PM EDT At 216 pm edt, doppler radar indicated a severe thunderstorm capable of producing quarter size hail and damaging winds in excess of 60 mph. this storm was located over rooks, or 12 miles west of burgaw, and moving east at 25 mph. 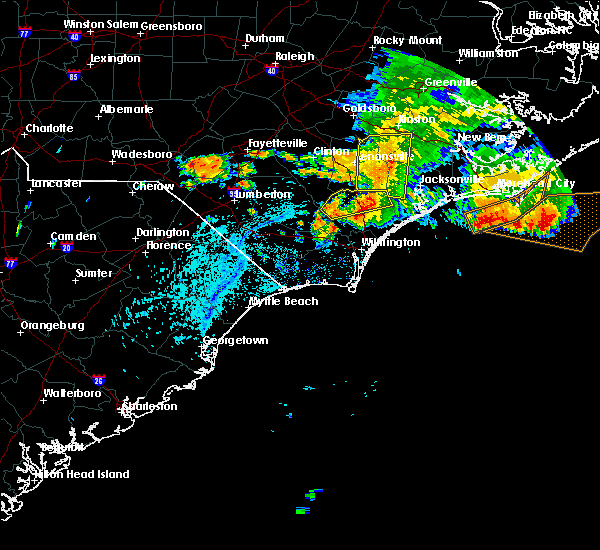 7/21/2015 11:22 PM EDT The severe thunderstorm warning for southern onslow county will expire at 1130 pm edt, the storm which prompted the warning has weakened below severe limits and exited the warned area. therefore the warning will be allowed to expire. however gusty winds are still possible with this thunderstorm. 7/21/2015 10:43 PM EDT At 1043 pm edt, doppler radar indicated a severe thunderstorm capable of producing damaging winds in excess of 60 mph. this storm was located near maple hill, or 10 miles southwest of new river station, and moving east at 35 mph. 7/13/2015 1:17 PM EDT At 117 pm edt, doppler radar indicated a severe thunderstorm capable of producing quarter size hail and damaging winds in excess of 60 mph. this storm was located 7 miles southeast of white stocking, or 10 miles east of burgaw. this storm was nearly stationary. locations impacted include, wrightsville beach, surf city, figure eight island, rich inlet, hampstead, topsail beach, porters neck, topsail, castle hayne, bayshore, ogden, scotts hill, rocky point, woodside, cape fear community college north campus, murrayville, edgecomb and ashton. this includes the following highways, interstate 40 between mile markers 405 and 416. interstate 140. 7/13/2015 1:05 PM EDT At 104 pm edt, doppler radar indicated a severe thunderstorm capable of producing quarter size hail and damaging winds in excess of 60 mph. this storm was located near ashton, or near burgaw, and moving east at 20 mph. 6/26/2015 8:28 PM EDT At 828 pm edt, doppler radar indicated a severe thunderstorm capable of producing quarter size hail and damaging winds in excess of 60 mph. this storm was located near sneads ferry, or near camp lejeune center, and moving southeast at 10 mph. 6/19/2015 7:39 PM EDT At 739 pm edt, doppler radar indicated a severe thunderstorm capable of producing quarter size hail and damaging winds in excess of 60 mph. this storm was located near new river station, and moving southeast at 10 mph.